Looking for easy yet affordable ways to honor the full moon? 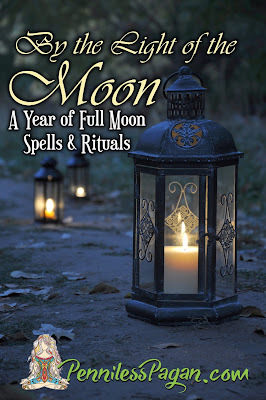 Join me in a year of full moon celebrations that will help you save time and money while channeling the lunar energy for effective magick! -Features 13 BRAND NEW previously unpublished spells such as Full Moon Dream Drop Wishing Well, Moon Dust Fire Spell Pouches, 13 Moons Blessing Chain, Falling Leaves Spell, Full Moon Pet Protection Spell, Moon Goddess Spiced Potion, Moonlight Herbal Sacrifice, and more! -Includes a super simple BONUS ritual for those particularly hectic nights! -Most spells can be completed in under 15 minutes, many at no cost! -Includes reference guides for herb substitutions using common household herbs and spices, a magickal intention color reference guide, tips to help save money on casting supplies, and advice on how to ensure successful spell casting! -Every purchase helps keep PennilessPagan.com a helpful and FREE resource for people who are looking to worship nature without spending a dime! So, brew yourself a cup of tea, nestle in on the couch, and learn how even the busiest Pagan can celebrate the full moon without losing their cool or blowing their budget! For a detailed list of spells and a sneak peek at photos, check out the By the Light of the Moon blog post.